The Kaibab National Forest with Bill Williams Mountain, background, in Williams, Ariz.
PHOENIX – Tourists and the residents of Arizona mountain towns that rely on them won’t have access to parts of some national forests this summer as authorities attempt to prevent wildfires in the drought-parched state during a critically dangerous time. Coconino National Forest officials announced Friday that the San Francisco Peaks, three more large areas near Flagstaff and two others elsewhere in the forest will close temporarily to the public beginning Wednesday because of the wildfire threat. Previously, the jointly administered Apache-Sitgreaves National Forests announced Wednesday that some areas will be closed to the public, although officials haven’t yet decided which ones. 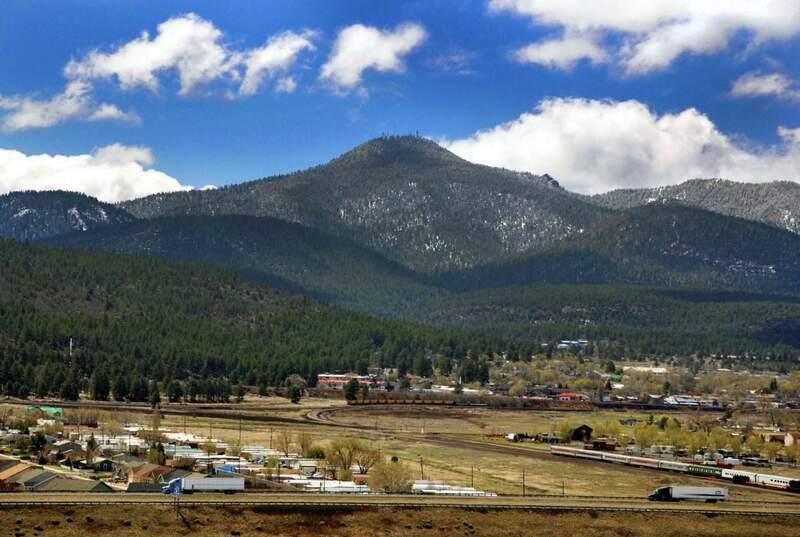 That’s after the Kaibab National Forest on May 11 announced the closure of about 23.4 square miles centered on Bill Williams Mountain near Williams. That closure is intended to protect the watershed for Williams, a northern Arizona city that’s a jumping-off point for many visitors to Grand Canyon National Park. The moves affect recreational activities such as camping, hiking and off-road vehicle use as well as thinning and other work projects in closed forest areas. “Forest closures of any kind are not taken lightly, as they affect many people, partner agencies, projects, permit holders, prior plans, and the public,” the Coconino National Forest announcement stated. Forest officials said the last full closures of the Apache-Sitgreaves and Kaibab forests were in 2002, while the adjacent Coconino National Forest last had a full closure in 2006. Campfire bans and other restrictions are in effect at national forests in most of Arizona and neighboring New Mexico, two drought-stricken states where a lack of precipitation has led to numerous fires in recent years. Arizona is already experiencing destructive wildfires. A May wildfire in north-central Arizona burned two homes and about a dozen outbuildings after an April fire about 60 miles (97 kilometers) to the east burned 33 homes and 54 minor structures. While forest closures in Arizona might result in fewer visitors to the towns within the mountains, many residents are supportive. “I’m sure there’s some impact there but I think we’re better off to have a little bit of impact than have our town burn down up here,” said Show Low City Manager Ed Muder. The city is in the Apache-Sitgreaves National Forests, which include the Mogollon Rim and the White Mountains. Both forested regions, which include many campgrounds and lakes, serve as havens for residents of Phoenix and other desert cities looking to escape the summer heat. Apache-Sitgreaves spokeswoman Liza Simmons said forest officials plan to decide next week what areas need to be closed. The closures likely would take effect immediately, she said. What areas will be closed will depend on considerations such as fuel conditions, possible evacuation routes and likely directions of wind that would drive wildfires, Simmons said. Once closures are in effect, “people wouldn’t be able to hike, they wouldn’t be able to fish, they wouldn’t be able to use their OHVs (off-highway vehicles), they wouldn’t be able to enter the area,” Simmons said. The Kaibab’s closure of the area near Williams affects local residents, including some whose property backs up against the mountain. But the town still sees enough activity from tourists to get by, Mayor John Moore said. “That particular area is critical because it is our watershed, so we try to protect it,” Moore said. Forest fuels, the slope of Bill Williams Mountain and other terrain would make firefighting difficult, she said. The area also is popular with hikers and campers, as well as locals who regularly set out on trails nearly in their backyards. “For us, it was really critical for us to close that area to any entry or recreation use. A fire starting at the base of the mountain could lead to enormous and long-lasting impacts to Bill Williams and the watershed,” Banks said. A closure of the entire forest would mean forest thinning projects, meant to reduce the risk of devastating wildfires, also couldn’t move forward, she said. The work is meant to reduce the risk of devastating wildfires yet sparks from heavy equipment and chain saws could start a wildfire, she said. With a full closure, Forest Service employees’ jobs would shift to making sure people don’t violate a closure order, Banks said. Associated Press writer Felicia Fonseca in Flagstaff contributed to this report.